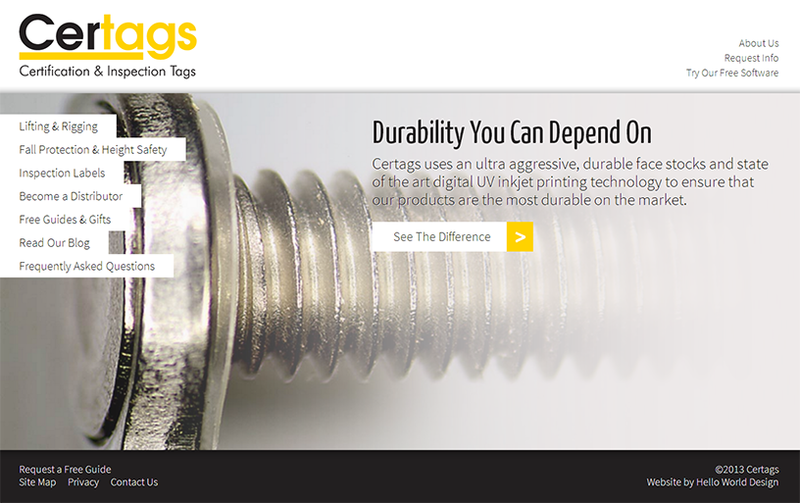 Hello World Design officially launches certags.com, a custom website for Certags: specialized manufacturer of industrial, hard wearing inspection and certification tags that are designed for use in a range of applications, from tags for lifting and rigging equipment to inspection labels for the fall protection and height safety industries. A family owned company with offices based in Portland, Ore., Certags has been dedicated to providing quality products and exceptional service for more than 40 years. Certags' industrial inspection and certification tags and labels are durable, clean and fully customizable. So we wanted to create a website that would reflect the company's product line, making a site that is minimal and responsive in its design.